To locate the five planets during late January 2016, the moon appears near Jupiter on the mornings of January 27 and January 28. Venus is the brightest starlike object, appearing low in the southeast. Viewing with a clear horizon, Mercury appears to the lower left of Venus. The bright star near the moon in Jupiter. Saturn appears to the upper right of Venus, above the star Antares. Mars appears between Antares and Spica. Jupiter rises in the east during mid-evening. 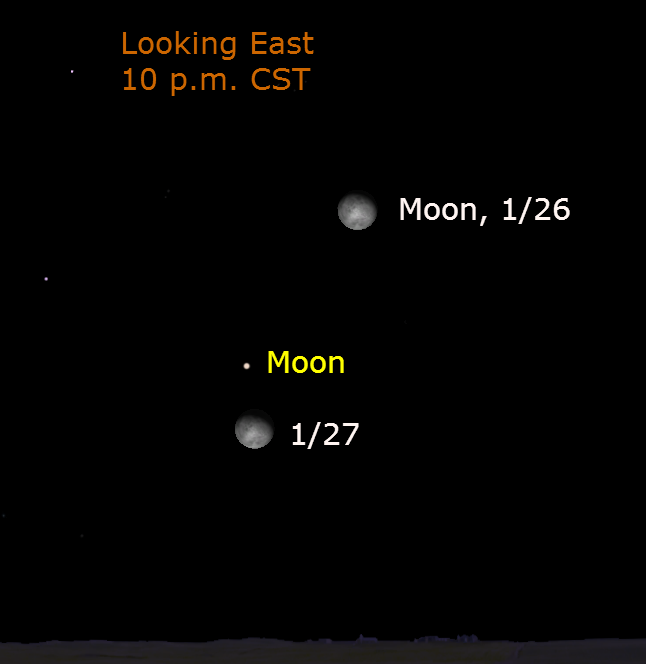 The chart above shows Jupiter and the moon on the evenings of January 26 and January 27. During the night the pair appears to move westward. By 6:15 a.m. CST they are in the southwest with the other planets trailing behind.